You no longer need to walk by tens of food trucks near you in hot summer checking their food menu. You don’t have to take a shower in raining days to order food from your favorite food truck. We already save you those kinds of food fighting trips. Just download Eatnstreet, while you set in your office, cafe shop, your car or even swimming pool. EatNstreet developed its homepage so that you can easily find food trucks near you and explore more about each food trucks located near you. With dual map and list view, you can get introduction details by press on the truck icon on the map or scroll the list without going to different page or view, just pull up the list bar and the full list will show all truck appear on the map. 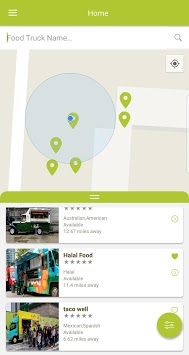 Using our map and list view you will know how far is the food truck from you, what type of cuisine they cook, its average rating and reviews from other food truck foodies. As well as its current status. 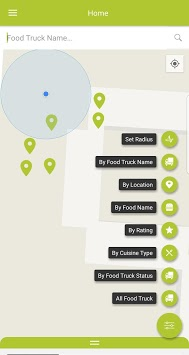 If you love any food truck, you can add it to your favorite list from homepage view, all you need a bit press on the heart shape in the quick details box. 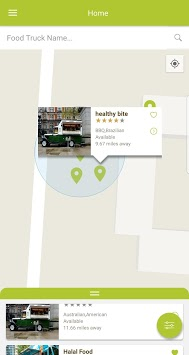 If you decided to order from this food truck, just press the small arrow in the middle lift and it will take you to the food truck profile page. Where you can read more about them, check their food menu, customer reviews, and their working hours. While you are going to add a menu item to the cart you can leave a special instruction note to be delivered to the food truck owners to tell them how you exactly like your food. You can check box if the food truck provides multiple options and add-on to the item. If you hanging out with friends, you can customize the same menu item for as many as you want, If you are three ordering cheese-steak, you can have each customized in a different way. We hooking you and your friends up lool. Reviews are there to read before ordering as well you can leave one, you are responsible in behave of food truck foodies community to tell them how your experience was. Read your food truck About us, know more about their story how did they start their food truck business, what inspired them and how hard work they do to keep you satisfied. EatNStreet team wishes you enjoy the effort and the work we put to improve food truck community. Customer can now claim their coupons from the app. Customer can receive a confirmation and follow up SMS notification. Add list view illustration for customer. Fix buges an error on the map search.